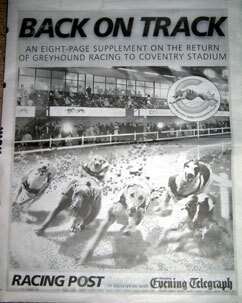 On Thursday 8 April there was an eight page supplement to the 'Racing Post' all about the return of the dogs to Coventry. There's little new for stox-fans although on page 7 there's the well worn quote about stock car and banger racing coming under review in the final stages of the improvement plans, but since the supplement was prepared in conjunction with the Coventry Evening Telegraph this looks like a re-working of their earlier press report. An interesting advert is from William Hill who are opening a new betting shop within the stadium offering a full service for all sports. Lets hope this means we can start betting on the car racing in the not too distant future!